Work Assignments During the Interview Process: What to do? A recent trend in the hiring process these days that are catching up is giving an assignment to the candidates before finalizing them for the job. With so many job seekers in a market with lesser and lesser opportunities, it is becoming difficult for the recruiters to find the right candidate for the job. Many times during the interview the employer is impressed by the attitude and with great conversing capability, but when hired for work many of them are not able to prove themselves worthy of the position. Few cases have happened where after the confirmation of the job, the employee do not perform or even put an effort to work on it. The whole process of hiring and firing is a loss for the company. 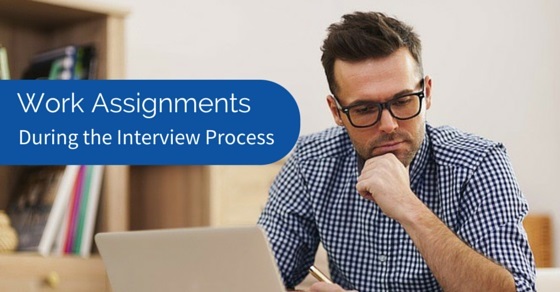 Hence an assignment is given to finalise the right candidate. This process has its own pros and cons which can be a time consuming effort to the person. Listed are the 15 things that every job seeker should know about the work assignments when employer asks you to submit some assignments during interview process. Work assignment is a way for the employer to know about you. As it becomes a professional interactive session, hence they get to know your working side. Whether you have doubts and queries or are you asking the right question. Also how much knowledge do you have about that specific area. It makes an easy task for the employer to take a decision whether to hire you or not. It a common practice among people to mention fake skill sets and during interview they are able to convince the employer. When hired, the person is not able to perform as said in the resume, hence the assignment becomes important to test the truth listed in the resume. The genuineness of the resume becomes essential in this process. Sometimes during an interview the chances of biasing towards a favourite candidate tends to pick up. For example, the manager could be from the same college of the person, or able to develop certain liking towards the candidate during the interview process. Favoritism tends to happen a lot in interview processes which reduces the chances of missing out on the right candidate, hence a loss to the organization. Sometimes a situation arises where choosing between final two or three candidates becomes a tough choice. With similar qualifications, skill sets the final call becomes difficult to take. The assignment test works as a tie breaker and makes the decision making quite easy. The candidate who fits the final bill of the company gets the opportunity. Whether the person has completely understood the brief to deliver is a way to figure it out from the assignment. It is a crucial process in the work before delivering the results, most of the employees tend to miss out on the exact brief given, hence the output is not in the right direction. The assignment is the best way to judge the analytical capability of the person. Another important part is the organization comes to know about your enthusiasm level towards the work. Organizations appreciate candidates who enjoy the work and are enthusiastic about it, rather than who might not be really interested in the work. Sometimes candidates might not be able to deliver the results, but due to their sheer enthusiasm and passion towards the goal leads them to be preferred for hiring. The work assignments are also beneficial to the candidate along with the organisation. It helps the candidate to know the kind of work he or she might be getting into the future and analyse the situation before getting into the job. It is convenient to know if you would really like to work with this firm or you would like to look somewhere else. It gives an understanding and information of your strategic planning capacity. How you would be delivering the results in a stipulated time period, a challenge essential for any organisation. The work assignment explains a lot about your work flow structure along with the capability to present it in the right flow. Every organisation prefers candidates with the right set of talent. These assignments also explain a lot about your strength and weaknesses which even you might not be aware of. It helps the organisation know your true skill and might hire you in a different profile altogether other than you would have applied for. Hence keeping the options open is never a bad idea. Employers like their employees to ask the right questions and to find the best possible answer for it. Therefore, it is important after the assignment is given to you, do go through the brief and ponder over it for some time. Then ask for the required additional info or clear your doubts then and there. This gives an approach of your thinking capacity to the employer and let them know that you have already taken charge of the situation. Many incidents have happened that employers give these assignments before hiring and once the candidate is done they might not even hire you. Later on you might come across that they would be using your idea already. To prevent from putting your effort without any results it is advisable to discuss non disclosure documents. Before committing and doing the assignment understand the time limitations and efforts required to be given in the assignment. It is of no use if you put in too much effort into it and later if you are not selected for the position. It will be a wasted effort for you, therefore, keep your efforts limited and work smartly. Also ensure not to spend too much time on it. Understand the exact requirement of the brief. Do not go overboard. Sometimes employers give a task which might not be achieved in the deadline given or the assignment might be not your specialisation. So it is good to be practical and discuss your limitations before rather than getting stuck with it without any results. Everyone loves their work in which they have put their heart and soul. It is a human tendency to fall in love with the work you do, in your eyes it might be the best work of your life or you would think that it will impress the employer in an instant. Know it is just a process to get a job and whatever the result maybe its good to finish the work and keep aside. Another essential point to note is that to keep your ideas simple and do not delve in the extreme details. In case you are not hired then the chances of getting your ideas will be reduced. It is good to mention the overview of what you intend to achieve and avoid using exact values and figures of it. Work assignments are effective trends in hiring process, which might take over a major role what interviews were and are. It does provide a clarity at both ends, whether you are an apt candidate to the organization or that job role is what you are looking ahead to pursue. It is better than getting into the job role you might not like and stress yourself out later on. The benefits of it vary from every individual and organizations. Yet one cannot ignore this trend so be prepared if in case the next organization you apply ask to submit an assignment.